Outdoor cooking traditions don’t get older as time goes on, they get better. Each year that you make sauce from your garden tomatoes, your recipe improves–a little less salt, a little more garlic. Similarly when you take a camping trip every Memorial Day weekend, your skills improve so much over time that one day you find you can set up your tent alone, in the dark, by touch! Climate change is the most serious issue facing the world right now, and our traditions and gadgets are changing to reflect that. Technology is becoming greener, more durable, more sustainable. You can see the change in the increasing number of electric and hybrid vehicles on the highways and rooftop solar panels on homes all over the world. And now, thanks to solar cookers like the SolSource Classic, your beloved backyard barbeque is joining the modern age! Outdoor cooking is long overdue for new technology. Charcoal, wood, and gas have long been the only fuel choices for people who prefer to spend their cooking time outdoors rather than cooped up in a kitchen, but not anymore! Cutting-edge solar grills are here to bring you and your family back outside. 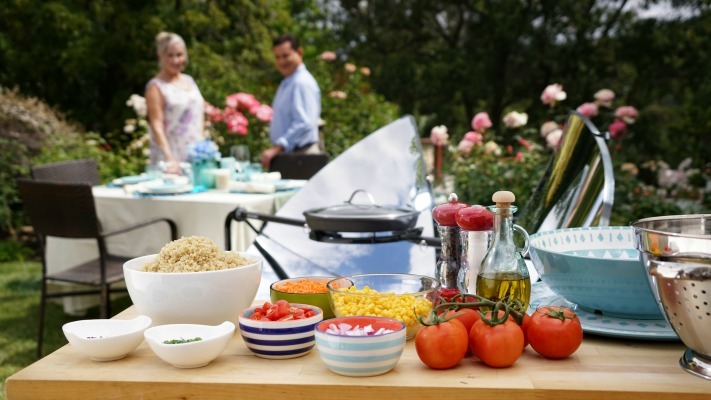 Solar grills are the next frontier in outdoor cooking. With no ash, embers, or open flame, the fire danger is so low they can go places where charcoal, gas, and wood fires are not permitted. So go ahead and grill up a few sausages at the park near your house–or slow-cook a nice roast on your apartment balcony. You’ll be doing both the earth and your tastebuds a favor. Because SolSource Classic is very light and portable, you can enjoy an outdoor barbeque anywhere your wanderlust drags you. You won’t have to make extra trips to the store for charcoal or gas, and you definitely won’t have to worry about releasing pollutants into the air. SolSource Classic is quick and easy to set up and to clean–no more wasted hours fussing with your hardware! Once you have it in place, it heats up five times faster than a charcoal grill, reaching 550°F in just a few minutes. You’ll be cooking fun, healthy, and delicious outdoor meals almost as soon as you can get them in the pan– and isn’t that a breath of fresh air! Outdoor cooking is a pure and primal way to enjoy nature, but for too long it has been limited by outmoded fuels. New solar technology is bringing the art of grilling into the present. Solar grills like SolSource Classic have kept the best parts of traditional barbeques and improved the worst. So now you can enjoy all the flavor, fun, and natural joy of a barbeque without the pollution and extra work of a charcoal or gas grill. Connect with nature using the power of the sun–go solar!